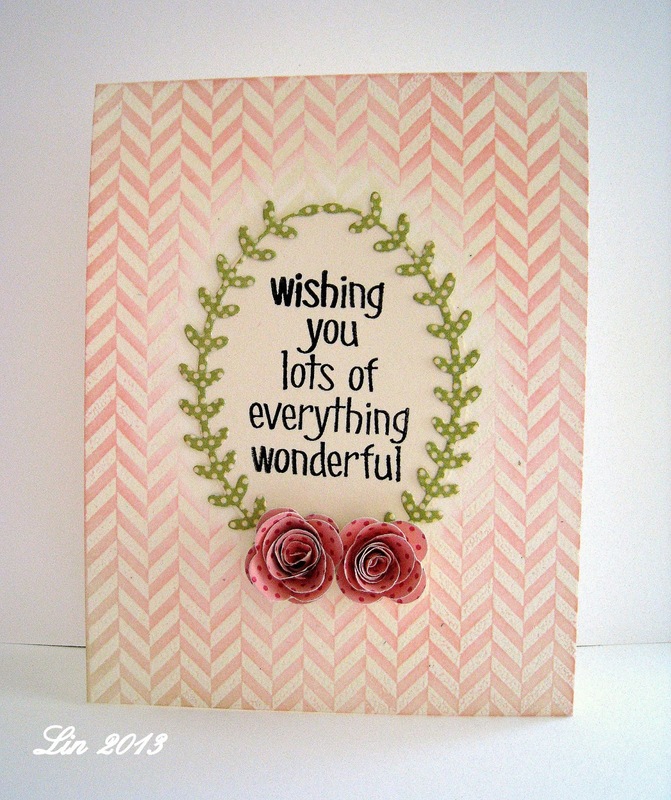 I wanted to make one more card to enter the Inspired by Stamping challenge to use Washi tape. It's been a long time coming, but I think that spring is here, so I made a card to celebrate the sunshine. I first stamped my sentiment from Ali Edward's Bring on the Sun, then placed my washi tapes on the diagonal. I added some embossed hearts from a cuttlebug embossing strip, part of a set called Cross My Heart, and then this sun which I had previously stamped and cut out (from Our Craft Lounge: Sunshine Cheer). I'm so pleased with the way this turned out - it practically made itself! Thanks for visiting - I hope you have lots of sunshine today! Just playing today, thought I'd give this week's Fusion Challenge. a play! As you can see, I was most influenced by the unique sketch, but I did bring in the multi-florals, too, using this paper from Simple Stories Vintage Bliss. My first thought was to emboss those concentric circles, but that didn't work out, so I used my Nesties circle dies to make them instead. On 2nd thought, it is looking decidedly like a yellow target, so now I'm not so sure about that decision :)) Stamps are Penny Black Dahlias and Eloquence. I added some enamel dots. These are assorted tapes; I don't have the slightest idea who makes what, but I do know that the red houndstooth is an We R Memory Keepers Washi paper - love this idea, as you can cut off any width you'd like for each project. After I'd positioned the tapes as I liked, I stamped my greeting (Penny Black Eloquence), ran my panel through a new Cuttlebug embossing folder, Cross My Heart, then attached it to a red card base, and added some Maya Road gingham blossoms and some black and red pearls. Looks like I'm the first to enter this challenge - since the winners will be a random draw, I guess I'd better go do another of these! I'd also like to enter this into the Die-Cut Diva's April challenge, to use Washi tape. Thanks to Dawn for pointing me there! 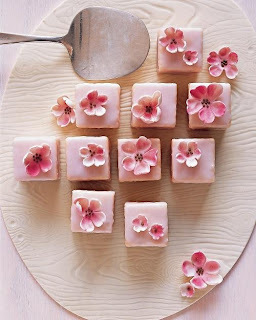 Here's our inspiration for the Moxie Fab World's Tuesday Trigger. Just loved the little blossoms and the pinks, so I went digging in my older stamps for just the right flower - found it in this Stampendous Charity Blossom, from 2000. It's actually 2 roses in a little group, but I separated out just 1 of them, and colored each one a tad different, using Memento markers. And I also pulled out this shadow stamp from Whispers/Sugarloaf Products, and stamped it in Bubble Gum ink. This sentiment seemed just right; it's from PTI's Garden Variety Set. The sweet gingham pink is an Amuse gingham........using up the last of it, time to reorder! The folder is called Poppy, by Cuttlebug, the paper is Core-dinations Vintage collection, Pink Tutu, sanded, the sentiment is from Jane's Doodles Mom's Flowers, and the little paper rose is from Mike's Recollections line. This is a 3-week Trigger, so there's lots of time to enter - I'm sure we'll be seeing some fun takes on the inspiration! I have always been drawn to watercolors over other forms of painting, and so when Cath announced her latest challenge at Moxie Fab World: The Wonder of Watercolor, I just had to play. I have 2 cards today. This pretty flower stamp is a Sparkle N Sprinkle image that came from a sweet friend Judy. It such a pleasing design that I decided to use it only with a sentiment. I stamped and heat embossed it to protect the ink from running, then used my yellow and green distress markers with a water pen to color it in. After it was dry I sponged on some tumbled glass distress ink around it, and then stamped my sentiment, from PTI's Garden Variety set, then mounted on an aqua card base. This technique is called watercolor stamping; you just paint right onto your stamp (in this case I used water-soluble markers) to color it, then spritz with water before stamping. I love the effect! After I was sure it was dry, I then stamped and heat embossed my sentiment, trimmed out the panel, framed it up with a bracket-punched edging and mounted it to my card that had been stamped with the Envelope pattern from Hero Arts. The flower image is also Hero Arts, Wildflower Garden, and the sentiment is from Impression Obsession "In a Garden". To finish I added some punched butterflies. Thanks for visiting today - hope I inspired you in some small way! Time for another Anything Goes challenge at the Simon Says Stamp blog! We are using Impression Obsession products this week, and we'd love to see them from you if you have any! I'm in a garden mood today, with 2 cards for you, each using a sentiment from the In a Garden stamp set. And my papers are all from Graphic 45's Secret Garden pads. This card started with the pretty shield in the 8" Secret Garden pad. It was the perfect size to hold my sentiment, so I fussy cut it out and framed it with a Die-Namics round Decorative Doily die cut. Then I chose the striped design paper. I added them to an embossed card front with some peachy pearls, a gift from Lisa at Christmas. I love how the Poppy embossing shows off the pretty main image! The papers in this line are almost too pretty to cut into, but I forced myself to mount this pastel collage print onto my card, and then added a blue panel stamped with a bigger sentiment from the same set as above. I sponged all the edges with old paper distress ink and then just trimmed it with some lace, dyed seam binding, and a paper flower made from some dies and centered with an enamel dot. Sweet Heidi has provided another $50.00 gift voucher to the Simon Says Stamp superstore to a random entrant to our challenge. Before I go, I wanted to let you know that Simon Says Stamp is sponsoring a CardKit challenge at Splitcoast Stampers. If you have the April Card Kit, make something, post it in the gallery at SCS, and a random winner will receive a $25.00 E-card for the Simon Says Stamp Store! This will be an ongoing challenge with each month's Card Kit, so keep it in mind for upcoming months! I recently found a really beautiful Cuttlebug embossing folder, called Poppy, by Anna Griffin. It is a nice big 5 X 7, too. It looks beautiful embossed on any color of cardstock, but when I saw the Moxie Fab World's current challenge, The Wonder of Watercolor, I knew exactly what I wanted to do with it. I embossed it 4 times on card size panels, and then chose 4 different colors of distress inks: tumbled glass, mustard seed, worn lipstick, and shaded lilac, and pounced the pads lightly across the raised surface of the embossed areas. Because the pads are square, you often see the marks left from the edges of the pads. BUT when you spritz them with water fairly quickly after pouncing, everything smooths out, and pools into lighter and darker areas, and for the most part, the ink doesn't go down into the non-embossed areas. When these panels were dry, I trimmed them in various ways and mounted them on card bases made of Tim Holtz Core'dinations Distress Collection colors to coordinate with the colors of the inks, (except for the lilac card) and embellished each one. I think these make a nice card set, and I'm pleased with the way they turned out. The tumbled glass one uses some flowers from Penny Black's Petal Party, also watercolored using my tumbled glass distress marker and a water brush. The sentiment comes from Simon's Flower Friend, and I centered the flower with an MME enamel dot. This one I kept fairly simple, just lining it with it's coordinating solid cardstock. The sentiment is from Technique Tuesday's Bring on the Sun, by Ali Edwards. Love her fonts! The worn lipstick one uses a stamp and die from Hero Arts Antique Flowers & Butterflies stamp and die set. Again, I used my worn lipstick distress marker to color parts of the butterfly, then used a water brush to pull the color to the rest of the image. My sentiment here is another Ali Edwards set, Simply You. And finally, this shaded lilac version may be my favorite.....it is such a pretty shade. Again, I used the Penny Black Petal Party flowers and watercolored them this time with my new Inktense watercolor pencils. The sentiment is from Hero Arts Luscious Patterned Flowers set; also another lovely font. Thanks for bearing with me for this long post! Virginia's cards are invariably colorful and happy, with a style all her own. Congratulations, my friend, on this well-deserved honor! I finally have the fantastic April Card Kit from Simon Says Stamp in my hands and I jumped right in to play with it, making 2 cards. I've been seeing more and more "bumble bee" colors lately, so that's the direction I went first. The only thing not from the kit are the black pearls on the corners of my shield. There are some gorgeous floral papers included, but I couldn't quite cut into them yet........I want to gaze at them a bit more :)). so I used a little flower and a heart that are tiny pieces of the Happy Every Day stamp set included in the kit to make my own floral design paper. I used 3 of the 4 colors in this Hero Arts ink cube set - they are a perfect match to the design papers! I framed it with a yellow solid and a striped grey from the Fancy Pants Park Bench papers in the kit, and then mounted it on the aqua cardstock from the kit. Next I ran my layered panel through a cuttlebug embossing folder, then attached it to my card before adding the MME enamel dots and the little banner with my sentiment (part of the stamp set). I LOVE these colors and the kits and the stamps included just keep getting better and better each month! Here's a card I made using components of the February and March Card Kits from Simon Says Stamp, along with their exclusive stamp set Just a Love Note. I fussy-cut the rose spray from one of the papers, glued it to the glassine envelope and inserted a small love note card into it, where I could write a personal message. I added some sequins from my own stash. Welcome to the last day of our April Theme Days at The Craft's Meow! Today we're making it into a Blog Hop - you should have arrived here from Jessica's blog. If you'd like to begin the Hop from the beginning, just start at The Craft's Meow Blog, where there will be a starting point, and then you will be directed from blog to blog. Here's my card, using some new papers from Simple Stories Vintage Bliss. Now you should hop along to Nina's blog! 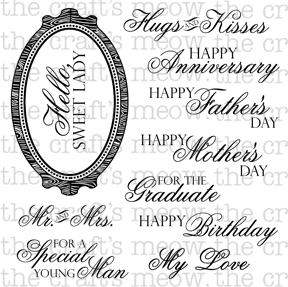 Don't forget to leave a comment at each blog by 8:00 PM Pacific Time on Tuesday, April 23; Lisa will draw one name for a $50.00 certificate to our store. AND today is the last day that Lisa will be running a sale for 21% off everything in the store!! The code is April21 at checkout, and it applies even to the already low prices on clearance sets! Don't miss out! This one uses some papers from Basic Grey's Picadilly line, along with a grey-striped washi tape and some twine. This uses just one of the sentiments. Here's a matching card for Mother's Day, which shows the pretty wood-grain frame that Nina included in this set. The frame coordinates with Spellbinders Labels 10. And Nina says to remind you that the silhouettes from last month's Sweet Silhouettes will fit inside this frame, too. This one uses papers from a K&Company pad, and I added some punched butterflies centered with rolled roses and a doily. Please leave a comment by 8:00 PM Pacific time at The Craft's Meow blog for a chance at a $15.00 gift certificate at our store. AND until Sunday, April 21, Lisa is running a sale for 21% off everything in the store!! The code is April21 at checkout, and it applies even to the already low prices on clearance sets! Please come back again tomorrow for a blog hop and a chance at a $50.00 gift certificate to The Craft's Meow store! I used 2 brown inks and 2 aqua ones, and added a Dear Lizzy chipboard sticker. Don't forget to visit The Craft's Meow to see all the other masculine or Father's Day cards that my teamies made! Leave a comment there by 8 PM Pacific tonight for a chance at a $15.00 gift certificate to our store. AND until Sunday, April 21, Lisa is running a sale for 21% off everything in the store!! The code is April21 at checkout, and it applies even to the already low prices on clearance sets! I hope to see you again tomorrow, when we'll be unveiling a new stamp set by Nina B! I used 2 TCM stamp sets, Beautiful Spring and Simply Delightful. My papers are MME Bramble Rose for the wood planking (doesn't it look REAL?) and Simple Stories Vintage Bliss. I added some punched Martha Stewart Doily Lace edging on either side of the sentiment. Don't forget to visit The Craft's Meow to see what my team-mates have made for you today. While you're there, leave a comment by 8:00 PM Pacific time, and Lisa will draw a random name for a $15.00 gift certificate to our store! AND until Sunday, April 21, Lisa is running a sale for 21% off everything in the store!! The code is April21 at checkout, and it applies even to the already low prices on clearance sets! And I hope you'll come back tomorrow, when our theme will be Father's Day or masculine cards! If you're looking for my post for The Craft's Meow today, please scroll down 1 post, or click HERE. Hi! Welcome to my blog this fine day! Today I'm bringing you my card for the Simon Says Stamp challenge this week. Our theme is Travel/Cityscapes - fun! I thought this Stampendous I Love Paris cling stamp would be perfect, and I love it! I stamped it using Hero Arts Charcoal mid-tone ink, and stamped the flowers again on a print from Jillibean Soup's Southern Chicken Dumpling Soup, then fussy cut them out and pieced them to the big panel. Then I scuffed up the edges of my panel and edged them with Spun Sugar distress ink. I used that ink also to dye some seam binding for my bow. This scrumptious background paper is from a Bo Bunny pad called Isabella, and I used one of their brads, also, on my bow. Since this stamp is so big, I couldn't layer as much as I'd have liked, but I did add a doily and some pale grey pearls. As usual, Heidi is giving away another $50.00 gift voucher to the random winner of this challenge. 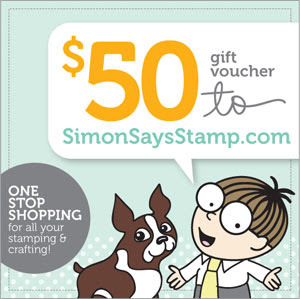 You can use it for anything you'd like at the Simon Says Stamp Superstore! Good luck! Hi! This month at The Craft's Meow we're doing something a little different; we're delaying our new stamp releases for awhile, and we've substituted a series of posts there, each with a different theme! AND beginning today, April 17 until Sunday, April 21, Lisa is running a sale for 21% off everything in the store!! The code is April21 at checkout, and it applies even to the already low prices on clearance sets. 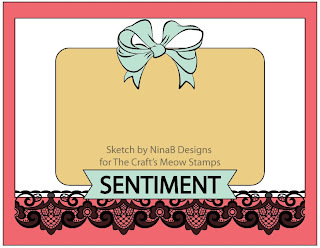 Please visit The Craft's Meow blog to see what my other teamies did with this theme. While you're there, don't forget to leave a comment - Lisa will be drawing 1 random name for a $15.00 gift certificate to spend at The Craft's Meow Store. Be sure and post your comment by 8:00 Pacific time, and Lisa will announce the winner tomorrow. Here's a card that I submitted to the last Paper Crafts Magazine call, but was unwanted........they had given us several color combinations to try. And I was so honored to see that I have been chosen as the Splitcoast Featured Stamper of the Week!! Many thanks to Stacy, who chose me! It is SUCH a thrill to see people CASEing my cards from my gallery there!! Thanks for visiting today! Enjoy the rest of your weekend. I wanted to add a few cards that use mostly Hero Arts stamps, made in the last couple of weeks. And my final card today is to enter this month's contest at the Hero Arts blog; we have the choice to use a sketch and another is to make a card "For Her", anything for a female.